I cannot find any results for this issue online, so this one has me baffled. 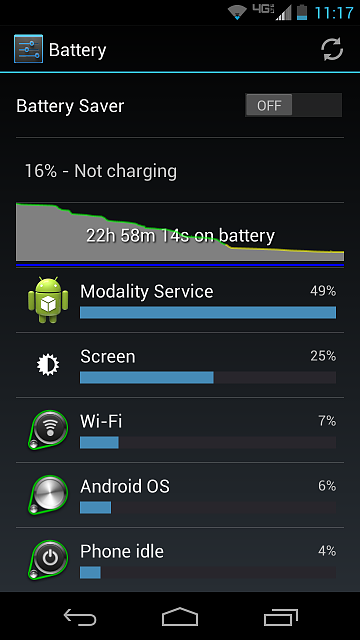 Lately I have been seeing "Modality Service" as the top battery drain. Restarts do not stop it, but it does seem to stop on its own sometimes. 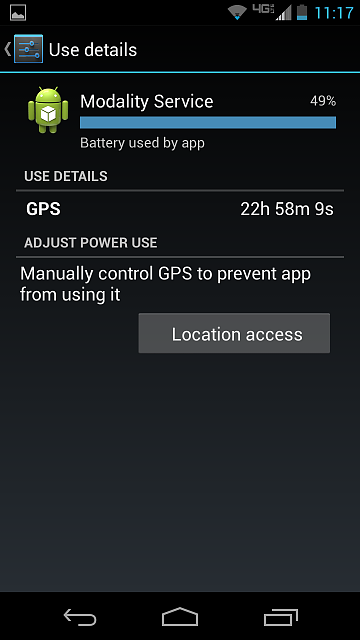 It seems to be gps related, but I have gps and location access off. I have better battery stats but forgot to screen shot it, although it didn't look like it was wake locked. 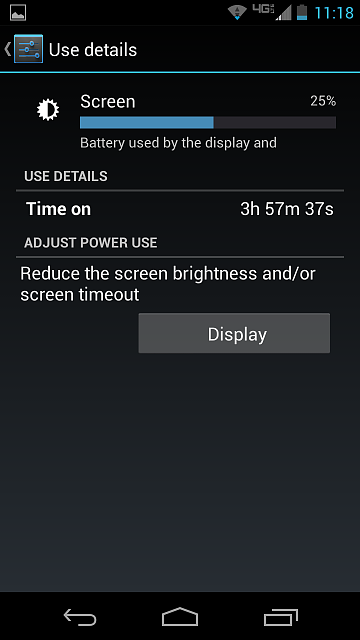 Also, around the same time this began I have noticed that my screen on time will just randomly change on occasion. Yesterday it jumped from 3 hrs to 5 hrs, today from 45 min to 6 min. Has anyone any idea what is going on here? NOTE: In the ss's it looks like I'm getting great screen on time, but I think that's my other issue acting up (have yet to confirm). That is a good question. I tried googling the service and it is unknown what that process does than your general description of GPS. Have you been using maps a lot? Have you tried restarting phone? If you tried those two, have you tried factory reset? No, I don't use maps very often at all. I certainly never had gps enabled that whole day. I have tried restarting and it doesn't remedy the issue. A factory reset is my last resort obviously, so I'm trying to hold off if I can. I just cannot believe that I can't find anyone else with this issue. If its not modality service draining my battery, it's media server. I'm growing extremely tired of constantly having to troubleshoot my battery drain to no avail. I'm going to have to wait until it starts acting up again because I don't see it on my battery list. I have betterbatterystats but it's not on there either. Here's to hoping the problem sorted itself out! I had the exact same issue crop up and I wish I could remember what I did to fix it. I used GSam Battery Monitor to look at the app usage and Wakelock Detector. I found several apps that I found I could disable notifications to and that seems to have helped. If memory serves, some of them were Google apps. Sorry I can't remember what all I did but am glad I wasn't the only one who had that crop up all of a sudden. Even with it you seem to be getting really good battery life though, so I wouldn't really worry. Do you have an Exchange or Outlook account? I just added one to my Moto X and when there was a syncing issue I got an email on my desktop saying something about Modality Service. I don't think you read my whole post. I have not seen the issue since the OP, but if I do that will be the first thing I look into. Thanks! Try turning off phone orientation. 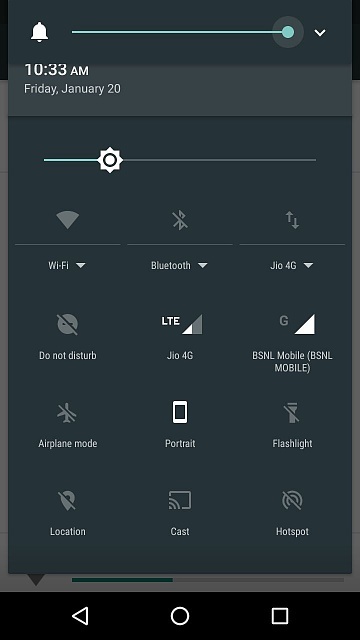 Modality Services should help your Motorola phone (Moto X, DROID ULTRA, MAXX, or Mini) “respond more intelligently to motion, phone orientation (e.g. face up/down) and stowed state.” In other words, Modality Services know if your phone is moving, how its lying on your desk, and if you have it in or out of your pocket. Nova Launcher - Causing excessive battery usage?